Join Woody and Buzz Lightyear as they attempt to rescue other toys from being taken away from their rightful home! You won’t find a child that doesn’t love Toy Story - the adorable characters and their touching story are endeared all over the globe. Now, you can have them right on your lawn! 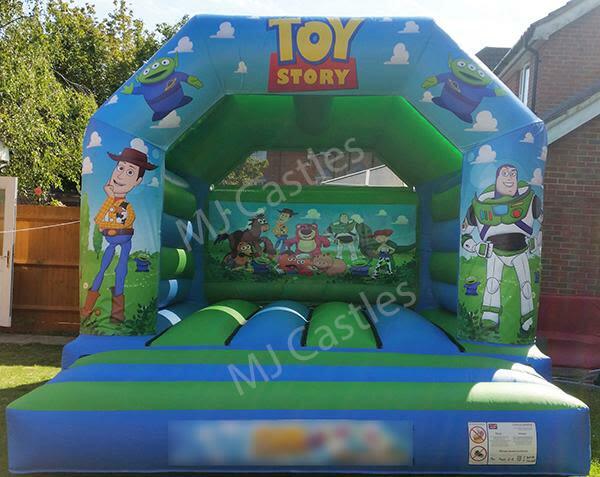 Whether your kid’s birthday is coming up, or there’s something big to celebrate, hiring a Toy Story bouncy castle is the best way to go. You’re guaranteed hours of fun and play as you let your kids’ imagination soar inside the inflatable castle. They won’t notice time pass by while inside this castle adorned with images of characters from the popular movie franchise. With this as the center of your party, the whole neighbourhood will either join the festivities, or be forever envious! With just a simple phone call, or online booking, you can enjoy all of this for just £55 for a whole day! Want it overnight? It’s only an extra £20! As parents, it is important to know that all of our castles are 100% safe and clean for your little ones. There’s no need to worry - we take care of everything including setting it up and cleaning it up after the celebration. What are you waiting for? Book your Toy Story castle today!